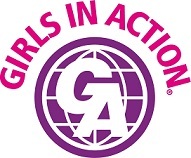 Girls in Action (GA’s) is a mission organization for girls who are in grades 1-6. GA’s help girls begin to develop spiritually towards a mission lifestyle. We learn what God is doing in the world and discover our place in God’s plan. The GA’s meet weekly on Sundays from 5:15 pm to 6:00 pm in Godspace Room A200. The girls hear mission stories and learn Bible verses through games and activities. We participate in community and church mission projects and work on an individualized achievement program called World Ventures. For more information on Girls in Action, visit their web page at www.GApassport.com or contact the church office at 843-249-2448.